Press Release – Walking in the Air! A Wimborne man, on remission from Lymphoma, is taking to the skies in order to raise money for LEAF, a Wimborne-based charity that supports blood cancer sufferers and their families. Jon Smallwood, 59, diagnosed with Lymphoma in 2009, said: ‘People might think Wing Walking is a terrifying experience – but it’s nothing compared to the fear people and their families can experience when cancer is diagnosed. If I can do this small thing to raise money to help, then it’s worth a bit of trepidation. Although I have raised money for cancer charities as The Headstand King in the past, this will be something rather faster and higher. 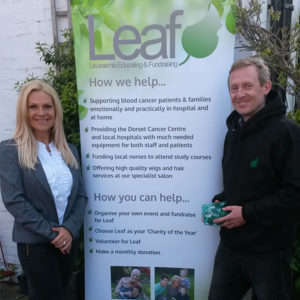 ‘Natasha Hunt, who founded Leaf Charity after recovering from Leukemia herself has always amazed me with her inspirational attitude and inexhaustible efforts both to raise money and personally support blood cancer sufferers and their families. For example, last year, she worked with a local brewery to develop a beer to increase awareness of the charity and many people will know of her through her local fundraising events, regular hospital visits and the famous green Leaf Pig money boxes. Natasha has helped so many people “walk on air” so I thought a Wing Walk was an appropriate way to help raise money for her Leaf Charity. I’ve been in remission since September 2009 and am back to full fitness, regularly running, working on The Swanage Railway and with Buckingham University, training teachers. I think it’s very important that people know that there can be a full life to live after cancer diagnosis and chemotherapy, and that’s why I support Natasha’s Leaf Charity with its amazingly positive approach”. Jon will be strapped to the wing of a biplane at Compton Abbas airfield near Shaftesbury on 19th August, and fly at 135 mph to raise money and awareness of Leaf Charity. You can support him in his efforts for Leaf at https://mydonate.bt.com/fundraisers/jonsmallwood1 and follow his progress on Leaf Charity’s Facebook page or Twitter @leafcharity .